We recently came across a post by Janis Petke who has created some beautiful pictures using Google Earth, PTGui panorama software and Photoshop. Barcelona, Spain. ‘Little Planet’ view by Janis Petke. 3D imagery from Google Earth. See all the images and a description of how it was done here. Janis is not the first person to do this, and we also found this album, for example. To learn how to make ‘Little Planets’ from panoramas see here. If you make your own images, be sure to give proper attribution to Google Earth and if your images include imagery or mapping data from third parties, those must be attributed too. For guidelines on what you may or may not do with Google Earth imagery see these guidelines. This reminded us of our post on changing the Field of View in Google Earth but sadly we were not able to find a way to get the full ‘Little Planet’ effect directly in Google Earth. 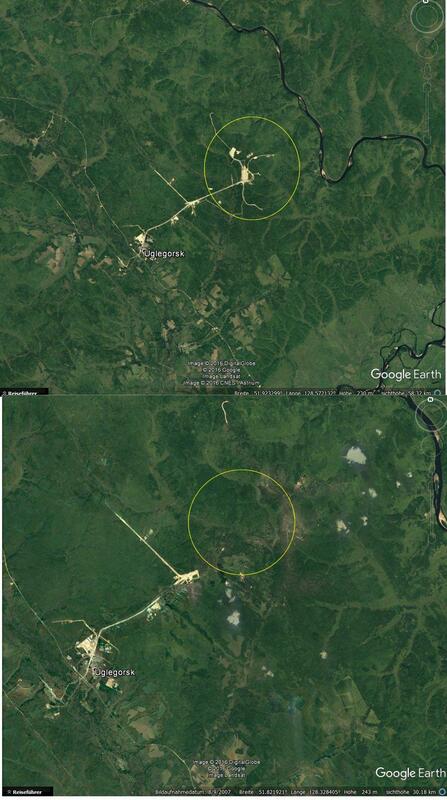 Pls look at Vostochny (Svobodny) 51.884395° 128.333932°. When you zoom in you see the new cosmodrom but if you further zoom in it vanished – any thoughts? When you are zoomed out, you see Landsat imagery that is relatively recent. When you zoom in, you see the higher resolution satellite imagery which is from 2007.